Here's the poster that misled me! I chose this film because the poster had some cartoon blood and I thought it was going to be a thriller of some kind. Boy was I wrong, but it a surprisingly nice way. 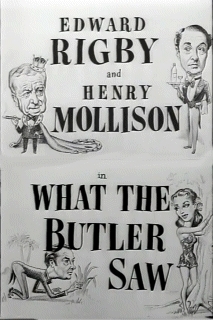 This 1950s British comedy is a delight to watch and probably original for its day, but in retrospect, we seen it since then in many other films. I’d like to link this to the theme: Fish out of Water. I swear I kept waiting on the blood or someone to be murdered! A Fish out of Water is a story paradigm where a character is placed completely out of his/her natural element. Many genres make us of this theme; however, I feel it plays best in comedy. In this film, there’s a British nobleman who has been running things on a tropical island for many years with his butler. They return home to their stodgy, uptight, stiff upper lip family only to find the King of the island’s native daughter has stowed away and followed them there because she’s in love with the butler. Pretty racy for its day (there are scenes of men in bathtubs and the native girl makes an appearance at a dinner party completely naked), it plays for laughs well, but it takes a love potion to really kick things into high gear. The maids are terrified of the princess and the matriarch is scandalized completely just at the thought of the whole thing. Best line in the whole movie… the snooty grandson who goes on and on the whole movie about how this scandal could ruin his position at the Foreign Affairs office and the Grandfather tells him, “There’s always farming” to which the grandson replies in the most deadpan tone of disgust, “You want me to spend the rest of my life with a cow?” Classic. Taking a character out of his/her natural element.